Apologies its near enough been a month since I last posted on here - sometimes life work just gets in the way. Anyway I'll do a separate update post on that. Over the last month I've been embracing the minimal styling when it comes to my hair and trying to add as much texture as possible. If you've been reading the blog for a while, you will know how much I love invisible dry shampoos for adding texture to my hair. Normally my dry shampoos of choice is Co Lab or Paul Mitchell (must resist temptation to write Phil), however since trying Redken's Pillow Proof Two Day Extender Dry Shampoo I've found that texture in my hair lasts all day. 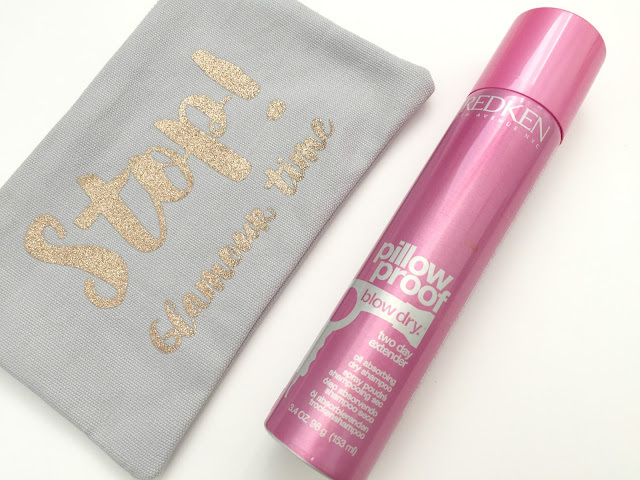 Normally I find that I have to add a texturising spray to keep volume in my hair, however the sole purpose of the Pillow Proof range is to extend your blow dry/hairstyle. Unlike any other dry shampoo which I've used, I find that I would have to apply more either later on in the day or the next morning to try and extend not having to wash it. With this dry shampoo however I'm finding that after initially using it, I don't have to reapply any until I wash my hair. I don't know if it's just me, but with some dry shampoos you can feel it in your hair - with this you don't. Personally I've found that the more high end the dry shampoo is the better quality it is - this is no different. Another bonus with this is the fact that it leaves no scent in your hair - when you initially spray it, you can smell a faint fresh minty scent. Yet as soon as it touches your hair, the scent goes and the dry shampoo goes to work. At £13.90 this is slightly pricey for a dry shampoo, however Hairtrade is one of the cheapest places online to buy Redken. This bottle has well over half left, so if you think about how quick you get through normal dry shampoo, to the length of time this has lasted me, it is worth splashing out the cash on this. Are you a fan of invisible dry shampoo, let me know what your favourites are.